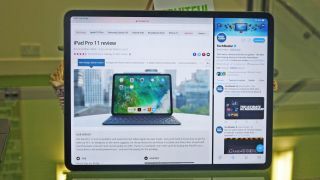 Split-screen mode is always useful, as it lets you open two tabs at once on your device, whether you need two documents open on your iPad Pro 11 or two social media accounts running on your iPhone XS. However, if you don't know how to start split-screen mode, you're out of luck, as iOS doesn't give you many pointers, and you could miss this useful function altogether. So to save you some hassle, follow this simple guide on how to start split-screen mode on an iPhone or iPad. To split your screen on iOS, you actually have to start by finding your second app, and opening it. Now close it again – all you needed to do was open it briefly, so it appears in your toolbar at the bottom of the screen. Now open the main app you want to split screens with – if you don't want the apps you're splitting the screen between to have equal sizes, choose the one that will take up the majority of screen space as this. Next, swipe up from the bottom to bring up the toolbar, with your pinned apps and also your most recent ones – this is why you opened the other app, as it should be on this bar. Press and hold down on this second app, and then drag it up off the toolbar. When you hover it over the first app, it should become a long thin rectangular box as shown below – drag this to the left or right side of the screen, whichever side you want the second app on, and release to open it there. If, when you pick up and drag the second app, it's in a second box, this unfortunately means the app doesn't support split-screen mode, so you're out of luck. On iPad you've now got one big app taking up most of the screen, and another sitting in a slice on the side – this might not be what you're looking for, but you can rearrange things in a few ways. If you want to hide this second app, you can simply touch the grey bar at the top of it and drag it to the side of the screen, which will cause the app to disappear off to the side. Then, if you want to bring it back, you can easily swipe in from this side and it will pop back up. The second tab now sits in front the first, but you can truly split the screen between the two tabs if you want. Press and hold the grey bar at the top of the second tab, and drag it down (or up). Both tabs will blur over, but when you release they'll be sitting side-by side, so no text is obscured in either. To reverse this, just do the same procedure again, and the second app will hover above the main one again, so you can easily swipe it away. If you want the second app to be bigger, you can easily drag the bar between them to the half-way line in the screen, or even further. The apps can only ever be a 50:50 or 25:75 split so you can't go crazy, but it's still useful if you're dashing between them.